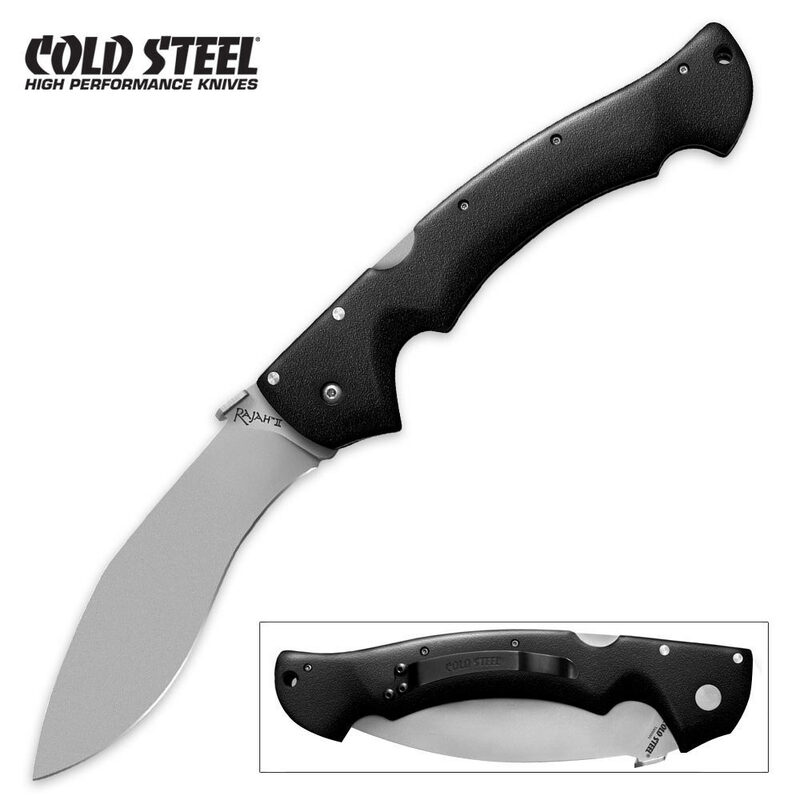 Cold Steel Rajah II Folding Knife | BUDK.com - Knives & Swords At The Lowest Prices! I have to say, this was my most anticipated order ever. It is absolutely amazing. The photo does not do it justice. The size of this blade is staggering. I have big hands, and they seem dwarfed when I hold this knife. Amazing price for this knife, probably the best you'll probably find. Easily my favorite purchase from true swords and my favorite product from cold steel. This is a MONSTER. I have been using a Spartan for an E.D.C. for the last 6 months, this is it''s replacement. This dwarfs the Spartan. I am a large man, 6'8", and this knife is perfect for me. I just got this knife last night. Its AWESOME! Just check YouTube vids for reviews and demonstrations. Ive actually been wanting to get this knife for a few months now....dunno why I waited so long. This may be the biggest folding knife with the Kukri blade design available. Comes really sharp with AUS-8 steel. Love the dull color of that blade. True Swords currently has one of the more competitive prices for this item so if you like this site then go ahead and order it. I was actually intending to carry this in my EDC (everyday carry) but I was still caught off guard by the sheer size of this thing even after watching so many vids about this knife. I still may carry it but its weight and size is noticeable...I'll have to see. It takes extra effort on my part to open this thing with just my right thumb so I usually open with 2 hands to be safe. But the Emerson Wave function works good...its when the knife's thumb stud thing catches onto the corner of your pants pocket and opens during extraction. Handle texture and grip is much better than I anticipated but may add a little bit of grip tape anyway. For size reference, I have a Cold Steel Voyager Tanto XL (5" blade) and when I compare these 2 knives side by side, my Voyager seems severely dwarfed....both blade and handle size. UBER cool knife. GET IT!!!!! !